1.4 oz package. Gluten free, vegan, 5g fiber. Ingredients: cashew, GF oats, pecans, inulin (dietary fiber), organic agave syrup, organic brown rice crisps (organic brown rice, organic brown rice syrup, sea salt), fruit juice, GF natural grain dextrins, raisins, organic sunflower seeds, dried apples, pea protein isolate, vanilla extract, safflower oil, ground cinnamon, natural flavors, sea salt, mixed tocopherols (natural vitamin E), rice bran. 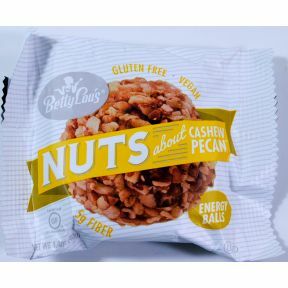 Allergens: Contains tree nuts (cashew, pecan) and traces of tree nuts (almonds). Good manufacturing practices are used to segregate ingredients in a facility that processes other products, which may contain peanuts, tree nuts, wheat (gluten), milk, soy and/or eggs.